7:01 — Someone runs onto the field at the Metrodome. I understand why they don’t show the action on TV, but the fact that they’re not showing it just makes me want to watch it even more (and because all the shots of the players standing around doing nothing are really, really boring). 7:09 — After a little trouble in the top of the 9th, the Twins win. 7:10 — With all of the Sammy Sosa excitement, I didn’t realize that Kenny Lofton was on the Rangers this year, and that he’s at 599 career steals. 7:12 — He gets number 600. There has been a noticeable amount of first-inning steals today — managers trying to set an aggressive tone for the season, obviously. 7:17 — Boneless Buffalo wings at Carl’s Jr.? I’m going to guess that the “wings” portion of the name is not quite accurate. 7:22 — Vladimir Guerrero’s batting helmet is already filthy. How does he do it? 7:31 — While the Angels announcers aren’t paying attention because they’re interviewing Troy Percival in the booth, Sammy Sosa strikes out. 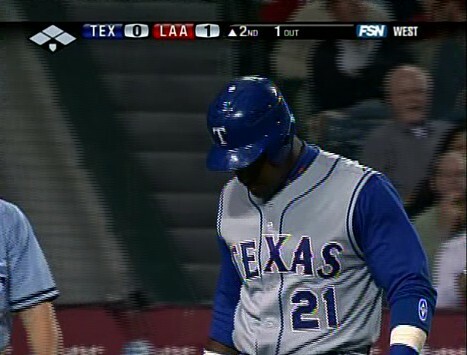 They don’t even get a closeup of him before he bats, just as he walks back to the Rangers dugout hanging his head. 7:35 — End of the Rangers’ half of the 2nd. I’ve been watching baseball for over nine and a half hours now. I think that’s all I can handle for today.